This article is about the various species of raspberry in the plant genus Rubus. For the widely cultivated Eurasian red raspberry, see Rubus idaeus. For the eastern North American black raspberry, see Rubus occidentalis. For other uses, see Raspberry (disambiguation). Raspberry derives its name from raspise, "a sweet rose-colored wine" (mid-15th century), from the Anglo-Latin vinum raspeys, or from raspoie, meaning "thicket", of Germanic origin. The name may have been influenced by its appearance as having a rough surface related to Old English rasp or "rough berry". Various kinds of raspberries can be cultivated from hardiness zones 3 to 9. Raspberries are traditionally planted in the winter as dormant canes, although planting of tender, plug plants produced by tissue culture has become much more common. A specialized production system called "long cane production" involves growing canes for a year in a northern climate such as Scotland or Oregon or Washington, where the chilling requirement for proper bud break is attained, or attained earlier than the ultimate place of planting. These canes are then dug, roots and all, to be replanted in warmer climates such as Spain, where they quickly flower and produce a very early season crop. Plants are typically planted 2-6 per m in fertile, well drained soil; raspberries are usually planted in raised beds/ridges, if there is any question about root rot problems. All cultivars of raspberries have perennial roots but, many do not have perennial shoots. In fact, most raspberries have shoots that are biennial (meaning shoots grow in the first growing season and fruits grow off of those shoots during the second growing season). The flowers can be a major nectar source for honeybees and other pollinators. Raspberries are vigorous and can be locally invasive. They propagate using basal shoots (also known as suckers), extended underground shoots that develop roots and individual plants. They can sucker new canes some distance from the main plant. For this reason, raspberries spread well, and can take over gardens if left unchecked. Raspberries are often propagated using cuttings, and will root readily in moist soil conditions. The fruit is harvested when it comes off the receptacle easily and has turned a deep color (red, black, purple, or golden yellow, depending on the species and cultivar). This is when the fruits are ripest and sweetest. High tunnel bramble production offers the opportunity to bridge gaps in availability during late fall and late spring. Furthermore, high tunnels allow less hardy floricane-fruiting raspberries to overwinter in climates where they wouldn't otherwise survive. In the tunnel plants are established at close spacing usually prior to tunnel construction. Raspberries are an important commercial fruit crop, widely grown in all temperate regions of the world. Many of the most important modern commercial red raspberry cultivars derive from hybrids between R. idaeus and R. strigosus. 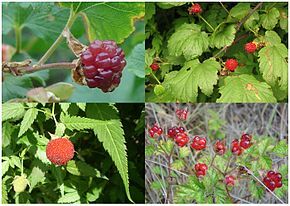 Some botanists consider the Eurasian and American red raspberries to belong to a single, circumboreal species, Rubus idaeus, with the European plants then classified as either R. idaeus subsp. idaeus or R. idaeus var. idaeus, and the native North American red raspberries classified as either R. idaeus subsp. strigosus, or R. idaeus var. strigosus. Recent breeding has resulted in cultivars that are thornless and more strongly upright, not needing staking. The black raspberry, Rubus occidentalis, is also cultivated, providing both fresh and frozen fruit, as well as jams, preserves, and other products, all with that species' distinctive flavor. Purple raspberries have been produced by horticultural hybridization of red and black raspberries, and have also been found in the wild in a few places (for example, in Vermont) where the American red and the black raspberries both grow naturally. Commercial production of purple-fruited raspberries is rare. Blue raspberry is a local name used in Prince Edward County, Ontario, Canada for the cultivar 'Columbian', a hybrid (purple raspberry) of R. strigosus and R. occidentalis. Fruits from such plants are called golden raspberries or yellow raspberries; despite their similar appearance, they retain the distinctive flavor of their respective species (red or black). Most pale-fruited raspberries commercially sold in the eastern United States are derivatives of red raspberries. Yellow-fruited variants of the black raspberry are sometimes grown in home gardens. Numerous raspberry cultivars have been selected. Two types of raspberry are available for commercial and domestic cultivation; the summer-bearing type produces an abundance of fruit on second-year canes (floricanes) within a relatively short period in midsummer, and double or "everbearing" plants, which also bear some fruit on first-year canes (primocanes) in the late summer and fall, as well as the summer crop on second-year canes. Those marked (AGM) have gained the Royal Horticultural Society's Award of Garden Merit. Raspberries are sometimes eaten by the larvae of some Lepidoptera species (butterflies and moths). Botrytis cinerea, or gray mold, is a common fungal infection of raspberries and other soft fruit under wet conditions. It is seen as a gray mold growing on the raspberries, and particularly affects fruit which are bruised, as it provides an easy entrance point for the spores. Raspberry plants should not be planted where potatoes, tomatoes, peppers, eggplants, or bulbs have previously been grown, without prior fumigation of the soil. These crops are hosts for the disease Verticillium wilt, a fungus that can stay in the soil for many years and can infest the raspberry crop. In 2016, total world production of raspberries was 795,249 tonnes, with Russia supplying 21% (164,602 tonnes) (table). Other major producers were the United States (17%), Poland (16%), and Mexico (14%) (table). Raspberries are grown for the fresh fruit market and for commercial processing into individually quick frozen (IQF) fruit, purée, juice, or as dried fruit used in a variety of grocery products such as raspberry pie. Traditionally, raspberries were a midsummer crop, but with new technology, cultivars, and transportation, they can now be obtained year-round. Raspberries need ample sun and water for optimal development. Raspberries thrive in well-drained soil with a pH between 6 and 7 with ample organic matter to assist in retaining water. While moisture is essential, wet and heavy soils or excess irrigation can bring on Phytophthora root rot, which is one of the most serious pest problems facing the red raspberry. As a cultivated plant in moist, temperate regions, it is easy to grow and has a tendency to spread unless pruned. Escaped raspberries frequently appear as garden weeds, spread by seeds found in bird droppings. An individual raspberry weighs 3–5 g (0.11–0.18 oz), and is made up of around 100 drupelets, each of which consists of a juicy pulp and a single central seed. A raspberry bush can yield several hundred berries a year. Unlike blackberries and dewberries, a raspberry has a hollow core once it is removed from the receptacle. Raw raspberries are 86% water, 12% carbohydrates, and have about 1% each of protein and fat (table). In a 100 gram amount, raspberries supply 53 calories and 6.5 grams of dietary fiber. The aggregate fruit structure contributes to raspberry's nutritional value, as it increases the proportion of dietary fiber, which is among the highest known in whole foods, up to 6% fiber per total weight. Raspberries are a rich source (20% or more of the Daily Value, DV) of vitamin C (32% DV), manganese (32% DV) and dietary fiber (26% DV) (table). Raspberries are a low-glycemic index food, with total sugar content of only 4% and no starch. Raspberries contain phytochemicals, such as anthocyanin pigments, ellagic acid, ellagitannins, quercetin, gallic acid, cyanidins, pelargonidins, catechins, kaempferol and salicylic acid. Yellow raspberries and others with pale-colored fruits are lower in anthocyanin content. Both yellow and red raspberries contain carotenoids, mostly lutein esters, but these are masked by anthocyanins in red raspberries. Raspberry compounds are under preliminary research for their potential to affect human health. Raspberry leaves can be used fresh or dried in herbal teas, providing an astringent flavor. In herbal and traditional medicine, raspberry leaves are used for some remedies, although there is no scientifically valid evidence to support their medicinal use. ^ a b "Raspberry". Online Etymology Dictionary. 2016. Archived from the original on 18 October 2016. Retrieved 16 October 2016. ^ "Brambles (Fruit Production for the Home Gardener)". Fruit Production for the Home Gardener (Penn State Extension). Archived from the original on 2017-05-23. Retrieved 2017-05-07. ^ Woolfrey, Sandra Marshall. A Country Mouse with one paw in the Village:Growing up in Prince Edward County (PDF). Archived (PDF) from the original on 2013-09-21. ^ RHS Plant Selector Rubus idaeus 'Glen Moy' PBR (F) AGM / RHS Gardening Archived 2013-06-17 at the Wayback Machine. Apps.rhs.org.uk. Retrieved on 2012-09-24. ^ RHS Plant Selector Rubus idaeus 'Malling Jewel' (F) AGM / RHS Gardening Archived 2013-06-17 at the Wayback Machine. Apps.rhs.org.uk. Retrieved on 2012-09-24. ^ RHS Plant Selector Rubus idaeus 'Glen Ample' PBR (F) AGM / RHS Gardening Archived 2013-06-17 at the Wayback Machine. Apps.rhs.org.uk. Retrieved on 2012-09-24. ^ RHS Plant Selector Rubus idaeus 'Glen Prosen' PBR (F) AGM / RHS Gardening Archived 2013-06-17 at the Wayback Machine. Apps.rhs.org.uk. Retrieved on 2012-09-24. ^ RHS Plant Selector Rubus idaeus 'Leo' PBR (F) AGM / RHS Gardening Archived 2013-06-17 at the Wayback Machine. Apps.rhs.org.uk. Retrieved on 2012-09-24. ^ RHS Plant Selector Rubus idaeus 'Malling Admiral' (F) AGM / RHS Gardening Archived 2012-04-03 at the Wayback Machine. Apps.rhs.org.uk. Retrieved on 2012-09-24. ^ RHS Plant Selector Rubus idaeus 'Autumn Bliss' (F) AGM / RHS Gardening Archived 2013-06-17 at the Wayback Machine. Apps.rhs.org.uk. Retrieved on 2012-09-24. ^ a b "Production of raspberries in 2016; Pick list by Crops/Regions/Production Quantity". United Nations Food and Agriculture Organization Corporate Statistical Database (FAOSTAT). 2018. Retrieved 19 February 2018. ^ Strik, B.C. (2008). "Growing Raspberries in Your Home Garden" (PDF). Growing Small Fruits. Oregon State University Extension Service. Archived (PDF) from the original on 31 May 2016. Retrieved 29 April 2016. ^ Iannetta, P. P. M.; Wyman, M.; Neelam, A.; Jones, C.; Taylor, M. A.; Davies, H. V.; Sexton, R. (December 2000). "A causal role for ethylene and endo-beta-1,4-glucanase in the abscission of red-raspberry (Rubus idaeus) drupelets". Physiol. Plant. 110 (4): 535–543. doi:10.1111/j.1399-3054.2000.1100417.x. 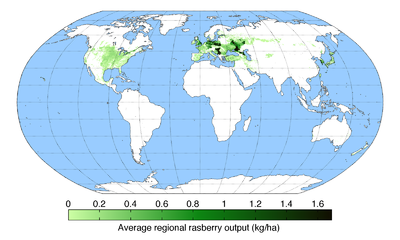 ^ a b "Nutrient data for raw raspberries, USDA Nutrient Database, SR-21". Conde Nast. 2014. Archived from the original on 16 April 2014. Retrieved 16 April 2014. ^ Carvalho, Elisabete; Fraser, P.D. ; Martens, S. (2013). "Carotenoids and tocopherols in yellow and red raspberries". Food Chemistry. 139 (1–4): 744–752. doi:10.1016/j.foodchem.2012.12.047. PMID 23561169. ^ Burton-Freeman, B. M.; Sandhu, A. K.; Edirisinghe, I (2016). "Red Raspberries and Their Bioactive Polyphenols: Cardiometabolic and Neuronal Health Links". Advances in Nutrition: An International Review Journal. 7 (1): 44–65. doi:10.3945/an.115.009639. PMC 4717884. PMID 26773014. ^ Holst, Lone; Haavik, Svein; Nordeng, Hedvig (13 June 2009). "Raspberry leaf – Should it be recommended to pregnant women?". Complementary Therapies in Clinical Practice. 15 (4): 204–8. doi:10.1016/j.ctcp.2009.05.003. PMID 19880082. Look up raspberry in Wiktionary, the free dictionary. "Raspberry" . Encyclopædia Britannica. 22 (11th ed.). 1911.